I'm already a Mary Engelbriet fan, and this newest picture book has reinforced my feelings in a big way. Her artwork is so much fun, and The Blessings of Friendship Treasury not only showcases it, but it also features a collection of "timeless sayings, poems, and Bible verses that teach the true meaning of friendship." Some of the illustrations are full pages, suitable for framing if you could bear to remove them. All of the pages of text feature fun fonts and more illustrations, making this book a perfect real aloud choice with plenty of visual interest for young listeners. Selections include inspirational quotes and Scripture verses, along with full poems from authors like Shel Silverstein. The Blessings of Friendship is the type of book that you can read from cover to cover or flip through from time to time for inspiration. It's pretty enough to leave out on the coffee table for all to enjoy. 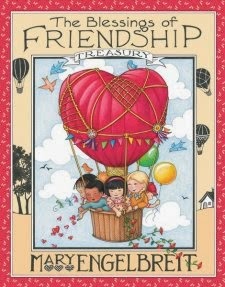 This celebration of friendship is sure to become a treasured keepsake. Click here to see my review of Mary's Peace on Earth!